Kate Jensen has spent the past 20 years working at sea and can’t imagine a more rewarding career anywhere else. As an Integrating Rating, she thrives on the sense of freedom that having the ocean as your office provides and loves nothing more than abseiling off the deck for a good grit blasting session. She’s also had plenty of firsthand experience dealing with the feelings of isolation that can shadow mariners, who may be separated from their families and loved ones for months at a time. It’s an issue that is garnering strong industry attention, with the theme of this year’s IMO International Day of the Seafarer campaign focused on seafarer wellbeing, in particular mental health and strategies to reduce stress. “If a loved one at home falls ill and you need to get home to them, sometimes you have to wait up to a week until you can get off the ship to go home to them. That's the absolute worst,” Kate said. It’s this sense of camaraderie with your fellow crew mates that helps you through the tough times, she said. To stoke morale, there are regular events such as quiz nights, footy tipping, poker nights, sporting activities and movie nights held on-board. For Kate, sticking to routine has also helped with settling in at the start of each swing and she makes it a priority to unpack her belongings as soon as possible. “I take around 100 photos with me to work that I stick up on my bulkhead without fail every single swing. It only takes me about 15 minutes to put them all up, but it's the only way I don't seem to miss my family so much while I'm out there,” she said. “Having a routine is vital, I believe, to staying in a fantastic head space. Exercising is also a great way to stay happy at work, and I make sure I have something to focus on while out there like a new hobby or researching my next travel destination. Kate’s career at sea started when she accepted the position of ship’s photographer aboard the Spirit of Tasmania, a passenger ferry that sails across Bass Strait between the Australian states of Tasmania and Victoria. 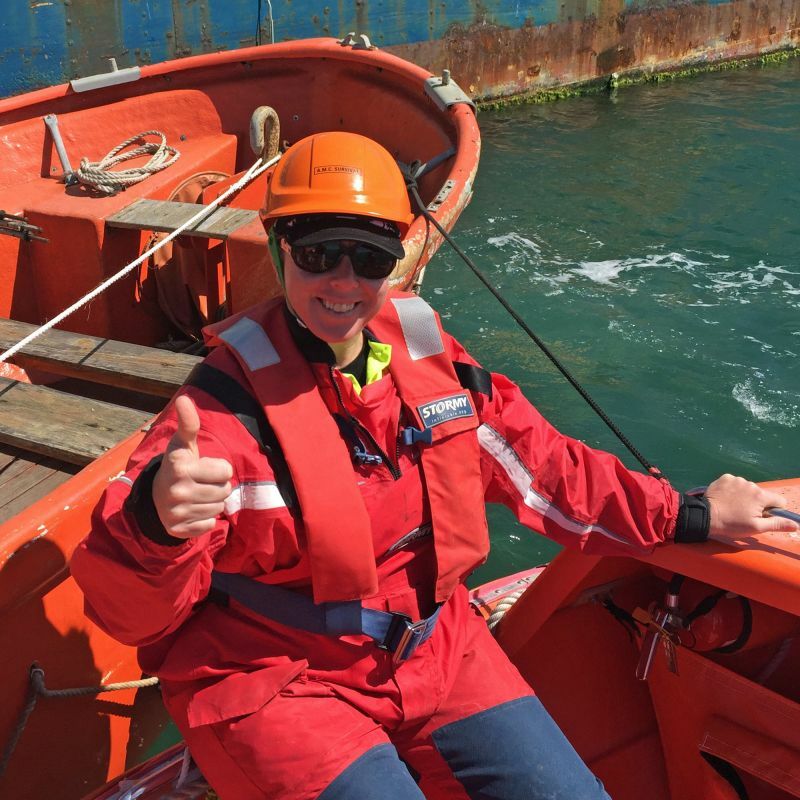 She worked as a photographer for 18 months before gaining her STCW95 safety at sea qualification at the Australian Maritime College and taking up a new job as a steward on the Spirit. After four years in total plying the waters of Bass Strait, Kate wanted to expand her seafaring experience and decided to return to AMC to complete her pre-sea deck training at AMC in 2002. She achieved her Certificate III in Maritime Operations to become a fully qualified Integrated Rating in 2003. She’s worked as an Integrated Rating for the past 16 years and enjoys the variety that her job provides. A typical day can involve port duties, mooring and unberthing, bridge watchkeeper duties, engine room gear man rounds, grit blasting, fabric maintenance, chipping rust, painting, greasing wires, maintaining running machinery, planned maintenance and rope work. “I find the easiest way to describe what an IR does is that a ship rusts, and it’s our job to make sure the ship is as aesthetically pleasing as possible. So we get rid of the rust and keep the ship looking good, while performing our jobs to the safest ability and ensuring we deliver our cargo safely and reliably,” Kate said. When asked what she enjoys the most about her job, her reply is swift. “I love the people that I work with the most, I have found the most amazing friends that I get to work alongside every single day out there, I am truly blessed as I have an exceptional group that I sail with,” she said.